If you don't know what to give your loved one for Valentine's, this might interest you. It is a wireless pulsating heart that activates when it's other half gets close. The heart consists of a radio receiver and in the other half you will find a small radio transmitter. Transmitter sends a signal every 0.5s for as long as it is switched on and it is controled with PIC12F683 microcontroller. 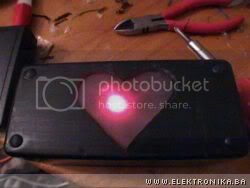 When receiver senses the transmitter it will blink an LED embedded in heart. Transmitter and receiver are small RF modules that operate on 433.92 MHz whose schematics equivalent can be found here.